As the House speaker takes flak over the firing and rehiring of the chamber's chaplain, the Rev. Patrick Conroy, Democrats try to turn a hot mess into a cool opportunity. Given the cornucopia of issues Americans have to select from each day, the recent firing and rehiring of the House of Representatives’ chaplain may not have bestirred many to form an opinion. 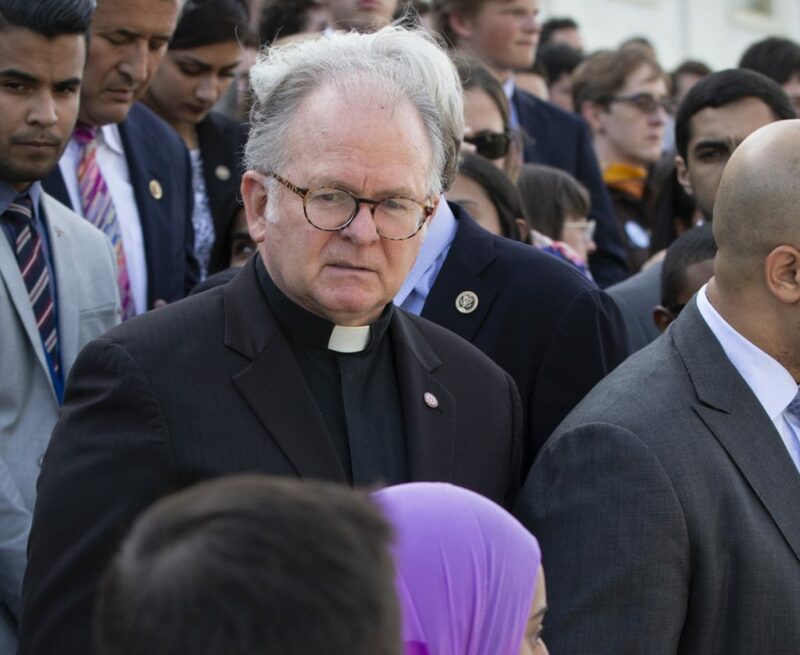 But these days, the Hill is alive with buzz as people absorb the odd goings-on between House Speaker Paul Ryan, who pushed the chaplain to resign, and the Rev. Patrick Conroy himself, who later withdrew his resignation, and Ryan’s acceptance of what appears to be pastoral bullying. Stranger things will happen before sundown – and incredulity is no stranger to this town. But author Dan Brown might want to check into the Four Seasons for a few weeks. Something is going on, or is it? Maybe, as seems to be the case, Republican House members just didn’t care for Conroy, and Ryan responded accordingly. The facts: Conroy, a Jesuit priest and the chamber’s chaplain since 2011, was, indeed, pressured to resign to avoid the drama of a firing. Conroy, who upon his resignation took to the pages of The New York Times to make his case, claimed that he may have been “asked to resign” because of a prayer he had offered a few months earlier in which he urged Republicans to remember “all Americans” as Congress debated tax reform. This is hardly a radical plea by a chaplain, whatever his vestments. 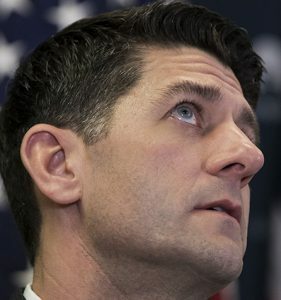 Urging people to take care of the poor is a pretty easy pitch – even to Republicans – but especially to Ryan, who may be the last Jack Kemp Republican in what has become the Party of Trump. No sooner had the ink dried on Conroy’s resignation letter than he announced that he had changed his mind. Ryan, who by then had likely regretted wading into that particular swamp, said, fine, you can stay. On Capitol Hill, where head-scratching has become a greeting gesture among those who’ve not yet been body-snatched, heads exploded while spokespeople went into tale-spin. At this point, however, one might have a better sense of why Ryan wanted Conroy to leave in the first place. As a Catholic whisperer said to me, “Wait a minute, buddy, redemption is on the other side, not in this world.” In other words, among the more-charitable remarks surrounding Conroy, many see an ego problem that has interfered with his pastoral role. While Ryan and Conroy dueled, Democrats wasted no time in trying to turn this hot mess into a cool opportunity. In a move that raised the bar on hypocrisy, the party of abortion – but not religious – rights galloped to the Catholic priest’s defense. Yet, back in March, Democrats blocked the Conscience Protection Act from being included in the 2018 omnibus appropriations bill. That legislation would have ensured the rights of anti-abortion medical practitioners to not be forced to perform abortions. Irony, a glutton for attention, didn’t stop there. When Ryan’s predecessor John Boehner left his job as speaker, it was on the sensible heels and prayers of Pope Francis, who had addressed Congress at Boehner’s behest. Ryan, alas, will be leaving his job under the cloud of having temporarily evicted a Jesuit priest from the House. The end result of this unforced fiasco is that soon there likely will be no chaplain at all. Once politicians start playing religious favorites, it’s a given that the position of chaplain will be viewed skeptically. Indeed, a debate has already begun about whether to eliminate the position. Many would applaud such a development in the spirit of separating religion and government. The problem with abolishing the office wouldn’t be primarily religious but all too human. When politicians and presidents pray, they’re essentially performing a rite of humility and submission to a higher order – if not to God, then at least to something greater than themselves. Implicit in this public exercise is a show of faith in Scriptures that guided this country’s Founders.